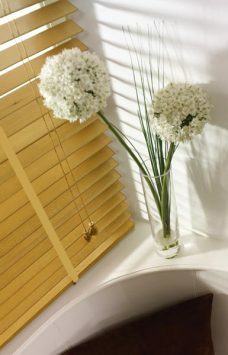 Basic Wooden Blinds provides a natural contemporary look. By the same token, adding tapes finishes the wood blind in either 50 mm or 35 mm. Nine slat colours are available online. The choice includes, light colours, medium in addition to dark slats. 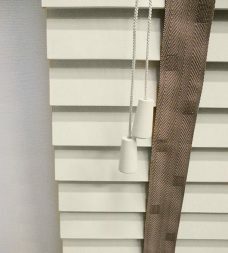 All non-branded wooden blinds. 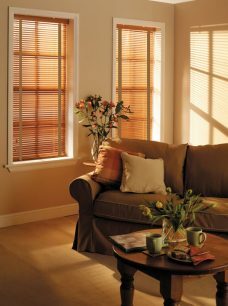 Fitting the wooden blinds either in the recess of a window or outside the window. 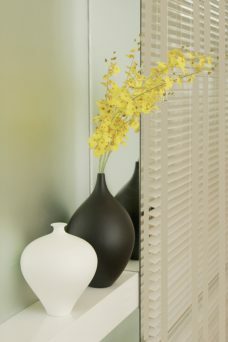 As standard straight pelmets are supplied. Pelmet returns are available upon request. Larger Pelmets incur an additional cost. As safety is an important factor, safety devices by the Blinds Safety Regulations are included. NB Slats can become dis-coloured over time. Additionally, as wood is natural product, there may be variation in slat colour or pelmet. The colour may also differ from any samples that may be sent to you. All blinds are non-branded blinds.